A pricey battery pack that earns your money. Mophie made a name for itself with its battery-pack cases for smartphones years ago. As the company grew, so did its product line. Portable batteries are a natural extension of Mophies product offering. 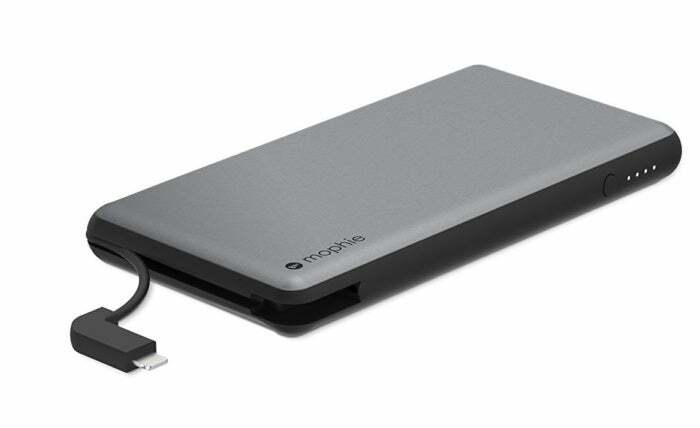 Note: This review is part of our roundup of portable power banks. Go there for details on competing products and our testing methods. We tested the Powerstsation Plus XL, a 12,000mAh (46.056Wh), lightweight battery pack. The $99 pack includes a cable that’s dual purpose, with a removable Lightning adapter for Apple devices and a Micro-USB adapter for everything else. There’s also a standard USB-A port on the pack. The built-in cable tucks into the edge of the pack, wrapping around roughly half of its perimeter. Removing the Lightning adapter to convert to Micro-USB is a breeze. A single Micro-USB port on the opposite end of the cable is used to charge the pack itself. A power button and four indicator lights make it easy to quickly check on the charge level of the pack, and see how far along it is when being charged itself. Included in the box is the battery pack and a short Micro-USB cable you can use to charge another device via the standard USB port, or charge the battery pack. Using our testing procedure, we found the Powerstation Plus XL to have an amazing 93.41 percent efficiency rating. This is the highest rating we’ve seen on any of the battery packs we’ve tested. We were able to verify the 5V/2.1A output with testing equipment. You won’t find official Qualcomm QuickCharge 2.0 or 3.0 support, sadly. The downside side is that our testing revealed a pack that doesn’t always charge at its advertised 5V/1.8A rate. Instead, the unit we tested charged at 5V/0.8A, taking a total of 12 hours to reach capacity. For a pack of this capacity, it shouldn’t take that long to refill. A secondary test showed the pack charged at the advertised rate, cutting charge time in half. Bottom line: At $99, the Mophie Powerstation Plus XL isn’t the least expensive battery pack we tested, and slow charging of the pack itself is disappointing. But it’s the most efficient pack we’ve ever tested.